Tonight’s side on The Midnight Tracker, my friends, represents a little bit of what free-form FM radio used to play. Those records, and the live double LP that followed “One World” later in 1971, summon the sound of a band at the top of its game. Emerging from the blue haze of time, we have this proof for you. 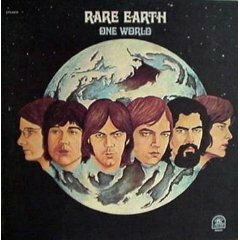 “What’d I Say,” “If I Die,” “Seed” and “I Just Want To Celebrate,” Rare Earth, from “One World,” 1971. This is Side 1. It runs 17:27. It’s out of print, apparently never released on CD, either. It all starts with a long jam, a Ray Charles cover full of sizzling guitars (even a “Day Tripper” riff), guitars vs. horns, guitars vs. Hammond organ, call-and-response vocals, Ed Guzman’s scorching percussion and a funky minute-long percussion outro. “If I Die” is a deep cut from those free-form FM nights. Finally, we count off the beat — “one … two … three … four” — and there is a smash single that was full of more sizzling guitars, a trippy bridge and more of Guzman’s scorching percussion. Throughout the four cuts, Pete Rivera’s vocals make it clear this record is being made by men, not boys. Rare Earth, of course, is long wrongly thought to be the only white act on a Motown label. According to the band’s official history, Motown signed other white acts, but Rare Earth was the only successful one, having honed its chops as a Motown cover band in the ’60s. Tonight on The Midnight Tracker, a double shot. First up, a side from the guy who wrote a song made popular by Eric Clapton. It was the success of “After Midnight” that prompted a friend to tell J.J. Cale he ought to record his own stuff. So, over the course of a week in late September and early October 1970, the 31-year-old Cale went into a couple of studios in the Nashville area and recorded most of “Naturally.” It was pretty much an indie record, put out on Shelter Records. 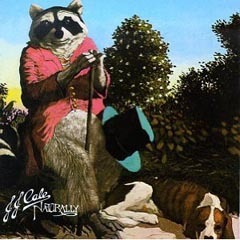 Side 2 opens with “Crazy Mama,” which in 1972 became Cale’s biggest hit. He also offers his version of “After Midnight,” which he’d done first as a demo in 1966. 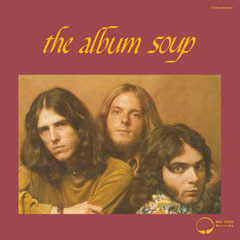 The fifth cut, “Bringing It Back,” was covered by Kansas on its debut album. “Crazy Mama,” “Nowhere To Run,” “After Midnight,” “River Runs Deep,” “Bringing It Back” and “Crying Eyes,” J.J. Cale, from “Naturally,” 1971. This is Side 2. It runs 15:53. The second half of tonight’s double shot is another side from a guy just getting started. Billy Preston was 19 and Sly Stone was 22 when they got together in Los Angeles in September 1965 to work on Preston’s third solo album. These young cats had similar backgrounds, born in Texas and steeped in gospel music while growing up in California. 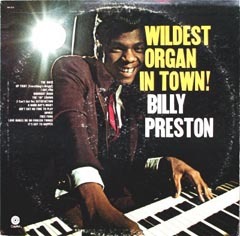 Preston, by then already a master of the Hammond B-3 organ, had cut two albums that consisted mostly of covers. That was a popular strategy at the time — pairing new artists with familiar tunes, or simply goosing sales with familiar tunes. Eight of the 12 cuts on that third album, “Wildest Organ In Town!,” are covers. Three of the other four tunes were co-written by Preston and Stone, who was the arranger on the record. They’re on Side 2, which we have for you tonight. “Advice” opens the side, its lyrics — “I want to take you higher” — foreshadowing what was to come from Sly and the Family Stone. “It’s Got To Happen” relies mostly on organ, piano and drums to create a quick little dance scorcher. “Free Funk” isn’t free funk but rather a slow, graceful, gospel-inspired bit. “Advice,” “Satisfaction,” “I Got You (I Feel Good),” “It’s Got To Happen,” “Free Funk” and “The In Crowd,” Billy Preston, from “Wildest Organ In Town!,” 1966. This is Side 2. It runs 14:40. Those are Rolling Stones, James Brown and Dobie Gray covers wrapped around the Preston-Stone originals. Those of us who live in Wisconsin — at least those of us who lived here when rock radio was thriving — got to sample from a big plate of musical influences. One tremendous influence was Detroit. There was all that Motown music, of course. But also the MC5, the Stooges, a young Bob Seger and, yes, even a young Ted Nugent. Then there was Dennis Coffey. In the ’60s, Coffey became one of Motown’s best session guitarists, one of the Funk Brothers. Even a partial list of singles on which he played is astonishing: “Somebody’s Been Sleeping,” by 100 Proof; “Give Me Just A Little More Time,” by the Chairmen of the Board; “If I Were A Carpenter,” by the Four Tops; “Want Ads” by Honey Cone; “If I Were Your Woman,” by Gladys Knight and the Pips; “Band of Gold” by Freda Payne; “Someday We’ll Be Together,” Diana Ross and the Supremes; “War” by Edwin Starr; “Nathan Jones” by the Supremes; “Smiling Faces Sometimes” by Undisputed Truth; “We Can Work It Out” by Stevie Wonder; and — whew! — most of the Temptations’ greatest and grittiest. I didn’t know any of that when I came to dig to those tunes in the early ’70s. I came to know Dennis Coffey only when he started releasing his own stuff, starting with the smash instrumental single “Scorpio” in 1971. As I go crate digging these days, I’m often looking for LPs I should have bought back when, but didn’t. 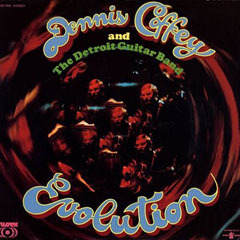 “Evolution” by Dennis Coffey and the Detroit Guitar Band is one such record. It’s the one with “Scorpio” on it, and a lot more. “Evolution” was Coffey’s second solo LP, recorded in 1970 at GM Studios in east Detroit and RCA Studios in New York and released on Sussex Records in 1971. Coffey has the guitar leads, as you’d expect, with many fellow Funk Brothers providing the backing. So, tonight on The Midnight Tracker, we have a bit of “Evolution” for you. Enjoy. “Getting It On,” “Whole Lot of Love,” “Summer Time Girl,” “Scorpio” and “Garden of the Moon,” Dennis Coffey and the Detroit Guitar Band, from “Evolution,” 1971. It’s out of print, but you might find a used vinyl copy online somewhere. This is Side 1. It runs 15:45. The first cut is a straight-ahead funk workout. The second cut, “Whole Lot of Love,” is a cover of Led Zeppelin’s “Whole Lotta Love.” The third cut, “Summer Time Girl,” sounds a bit like the Temptations’ “My Girl.” You know the fourth cut. The fifth cut, “Garden of the Moon,” is a dreamy, spacey bit of jazz rock. Much of what I know about about soul music comes from listening first to AM radio in the early ’70s, then FM radio for the rest of the decade. However, mine tends to be a wide but shallow pool at times. I plead guilty as charged when it comes to the Chi-Lites. I long knew them only for their smooth, gentle love songs, the radio hits — “Have You Seen Her” from 1971 and “Oh Girl” from 1972. A short while back, I heard “(For God’s Sake) Give More Power To The People,” a powerfully funky protest song featuring Creadel “Red” Jones’ bass voice. A bass? With the Chi-Lites? Head asplode. It’s from 1971, done along the lines of the stuff done by the Temptations at the time, and oh, how I dug the Temptations. So I started digging — and digging for — the Chi-Lites, who came out of Chicago and worked together for a decade before hitting it big in the early ’70s. I recently found tonight’s record for a dollar. It’s a delightful mix of those smooth, sweet sounds and the funkier stuff. As the liner notes on the Brunswick Records album jacket say: “Eugene Record, Marshall Thompson, Robert ‘Squirrel’ Lester and Creadel ‘Red’ Jones are the four stars of this amazing quartet.” Record sings lead, Thompson and Lester complement him and Jones’ bass anchors it all. In the late ’50s, Record and Lester started out with another singer, Clarence Johnson, in a group called the Chanteurs. Thompson and Jones were a group called the Desideros. About 1960, they joined forces and became the Hi-Lites. In 1964, they became Marshall and the Chi-Lites, the latter reflecting their Chicago roots. Not long after, Johnson left the group, and they went simply as the Chi-Lites. 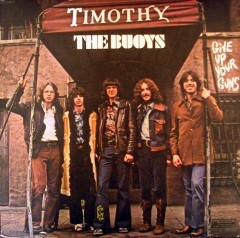 It wasn’t until they signed with Brunswick Records in 1968 that they started to make it nationally. Their peak years were 1969 to 1973. Thompson and Lester continue to perform as the Chi-Lites along with Frank Reed, who joined them as lead singer almost 20 years ago, after Record left the group. Record and Jones have since died. Enough talk. As those liner notes say, “stoke up your stereo and treat yourself to a generous helping” of the Chi-Lites. Here’s Side 1. “Yes I’m Ready (If I Don’t Get To Go),” “We Are Neighbors,” “I Want To Pay You Back,” “Have You Seen Her” and “(For God’s Sake) Give More Power To The People,” the Chi-Lites, from “(For God’s Sake) Give More Power To The People,” 1971. It runs 20:40. Record — the lead singer — also produced this album, did some of the arrangements and wrote or co-wrote seven of the nine songs. Ladies and gentlemen, this is Tom Jones! If you are a regular visitor to our other blog — AM, Then FM — you know we dig Tom Jones. Tom Jones has a new record coming out — his first in the U.S. in 15 years — and we’re looking forward to it. “24 Hours” is due out on Nov. 25 on S-Curve Records. It is reported to be full of retro soul. “The fire is still in me,” he says. We’ve seen him live. We believe it. And then today, our friend DJ Prestige over at Flea Market Funk serves up a vintage Tom Jones tune that rocks. We’re just going with the flow. Tonight on The Midnight Tracker, we also have some vintage Tom Jones for you, and it also rocks. Digging for old Tom Jones records is a bit of a crapshoot. There usually are a couple of gems on each album from the ’60s or the early ’70s. And, yes, there usually are a couple of unlistenable tunes on each album. TJ did his best to appeal to all of his audiences — from the girls who wanted to bed him to the guys who wanted to hang with him to the little old ladies who wanted to mother him. It’s a pretty good representation of what you get with Tom Jones. You may not dig all of it — a cover of “Cabaret” may not be for all tastes — but there’s sure to be something you’ll like. All that, and it’s live! So you get the added bonus of a powerful Vegas show band and Tom Jones’ stage patter with the ladies. Life is good. 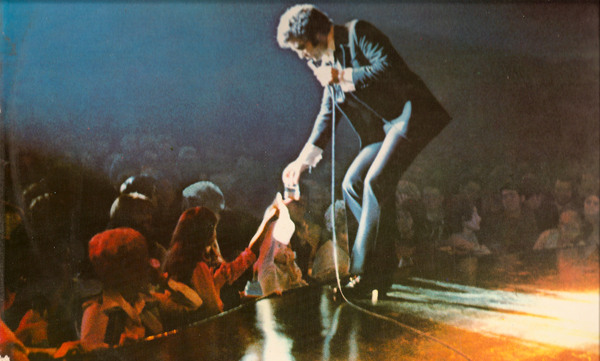 “Dance of Love,” “Cabaret,” “Soul Man,” “I (Who Have Nothing)” and “Delilah,” Tom Jones, from “Tom Jones Live at Caesars Palace Las Vegas,” 1971. It’s Side 1 of four sides. It runs 16:26. Johnnie Spence conducts that big band, which features Jim Sullivan on lead guitar, John Rostill on bass, Bobby Shew on lead trumpet, Kenny Clare on drums and the Blossoms on backup vocals.